Progress in reforms is like the movement of the hour hand of the clock: human eye is unable to detect the movement in it and yet it has gone full circle twice a day. 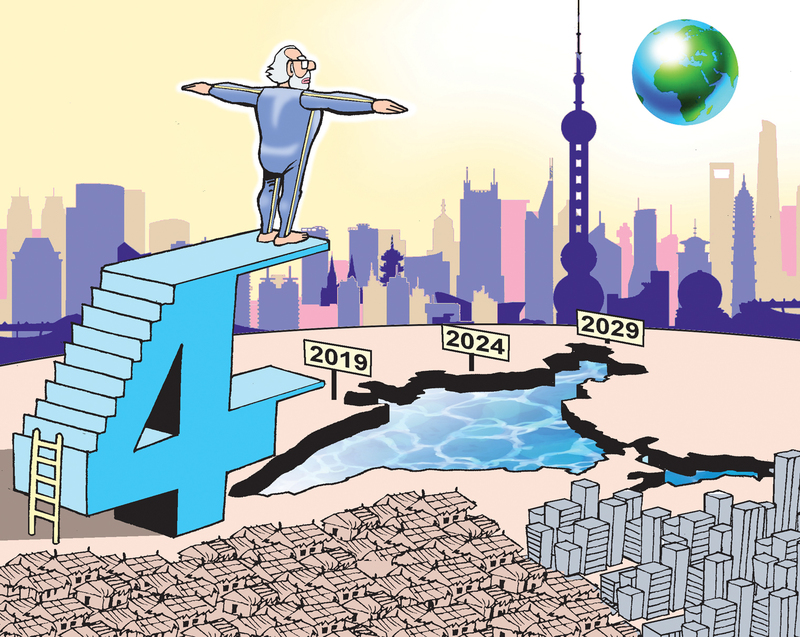 While naysayers complain that they can see no progress in reforms, reforms in the past four years have accumulated to the point that only highlights can fit a newspaper column. During the last two full fiscal years of the United Progressive Alliance (UPA) government, inflation had averaged 9.7% and growth 5.9%. To address inflation, the new government adopted inflation targeting on the monetary front and a strict fiscal consolidation plan on the fiscal front. To address growth, it undertook numerous structural reforms. The result has been an average inflation rate of 4.3% and GDP growth of 7.3% during the past four years. Governance has been a key focus of the government. The government’s concerted efforts towards improving the ease of doing business have translated into India jumping from 140th to 100th position in the World Bank rankings. In parallel, the government has worked to improve the ease of living. Citizens no longer need to have copies of degrees and diplomas certified by a Gazetted Officer; they may store soft copies of their degrees and diplomas in DigiLocker; and they may access many central and state services online through portal Umang. Forty million BPL households have received LPG connections under Ujjwala Yojana. The government is working to end corruption on a war footing. Demonetisation, a daring act, was an integral part of this effort. It has yielded handsome dividend through many channels: detection and closure of lakhs of shell companies; disqualification of lakhs of company directors; destruction of black wealth in real estate through a sharp decline in prices; rise in the number of income tax payers; and transmission of a strong signal of the government’s resolve to combat corruption. Replacement of the Planning Commission by Niti Aayog has been a major institutional innovation. The new institution has emerged as an active promoter of the prime minister’s reform agenda. It has also forged a more cordial and equal relationship with the states. The second set of reforms demonstrates the ability of the government to do programmes on scale. Three initiatives in this category stand out: Aadhaar, Jan Dhan Yojana (JDY) and Swachh Bharat Mission (SBM). Aadhaar cards have risen from 650 million in March 2014 to 1.2 billion. At peak, the government issued 8.65 million cards in August 2017 alone. Under JDY, 18 million bank accounts were opened in one week during August 23-29, 2014, a feat that found mention in the Guinness Book of World Records. Today, the total number of JDY accounts stands at 316 million. Finally, under SBM, rural households with toilets in their homes have risen from barely 38% to 84.2% with 17 states declared open defecation free in rural areas. We are now within striking distance of ending open defecation by October 2, 2019, 150th birth anniversary of Mahatma Gandhi. Important structural reforms include deregulation of petrol and diesel prices, further opening to foreign direct investment (FDI), shift to direct benefit transfers (DBT), the Goods and Services Tax (GST), Insolvency and Bankruptcy Code (IBC) and academic and administrative autonomy to top universities and colleges. On petrol and diesel prices, the government must be applauded for refusing to reverse the reform despite political pressure from all sides. On FDI, the opening up in e-marketplace promises a major overhaul of retail marketing in India. The shift to DBT using Aadhaar instrumentality has led to the elimination of vast number of ghost beneficiaries. Various criticisms around its implementation notwithstanding GST reform, which required a constitutional amendment and multiple legislations, constitutes a landmark achievement of the government. With a single nationwide tax replacing a vast number of state and central taxes, we can count on major efficiency gains. Already, the movement of commercial vehicles along highways has speeded up by 15% on average. I have lamented, for nearly two decades, that India lacks a modern bankruptcy law. IBC has finally filled this glaring gap. Building on it, the Reserve Bank of India (RBI) circular of February 12, 2018, has modernised regulations governing recovery of bank loans. This reform will go a long way towards solving the recurrent problem of non-performing assets (NPAs). As the case of Bhushan Steel illustrates, RBI is also successfully deploying IBC to clean up existing NPAs. Despite their launch nearly three decades ago, reforms had left untouched the area of higher education. That too has been addressed now with the government giving unprecedented academic and administrative autonomy to our top universities and colleges. The reform will stimulate much needed competition among our academic institutions. One area in which the government has erred, however, is international trade. Decades of efforts to liberalise trade by governments led by both BJP and Congress have been reversed, with hikes in customs duties on a large number of products. We have also failed to forge any market opening free trade agreements with our trading partners. The next government will need to do course correction in this important area.